Covers ferro cement boat building plastering tools and their use, preparation for plastering, plastering, steam curing and hull repair. Applying the mortar to a ferro-cement hull is hard work. The chemical action of setting cement waits for no man. The people undertaking this strenuous and exacting job must work hard and fast to properly apply the mortar to a hull. The mortar must thoroughly penetrate the mesh, and be smoothly finished both inside and out or all the good work preceding plastering can be destroyed. Plastering is an extremely critical stage of boat-building but the most rewarding. 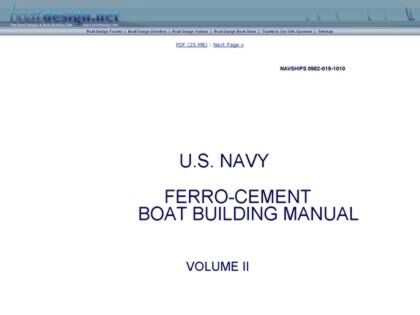 Web Site Snapshot: If available, above is a snapshot of the U.S. Navy Ferro Cement Boat Building Manual - Volume 2 web site at http://www.boatdesign.net/ferro-cement-boat-building-2/001.html as it appeared when this site was added to the directory or last verified. Please Note that Boat Design Net has no involvement with the above web site; all content and images depicted in the above thumbnail are the property and copyright of U.S. Navy Ferro Cement Boat Building Manual - Volume 2 unless otherwise noted on that site. Description: Covers ferro cement boat building plastering tools and their use, preparation for plastering, plastering, steam curing and hull repair. Applying the mortar to a ferro-cement hull is hard work. The chemical action of setting cement waits for no man. The people undertaking this strenuous and exacting job must work hard and fast to properly apply the mortar to a hull. The mortar must thoroughly penetrate the mesh, and be smoothly finished both inside and out or all the good work preceding plastering can be destroyed. Plastering is an extremely critical stage of boat-building but the most rewarding.